Short Story; Ultra Sound; Note Worthy; Upside; Remembrance; Ambrosia; Tsunami; Can Your Glue Do This? ; Intelligent Design. 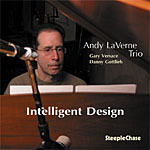 Andy La Verne: piano; Gary Versace: B3 organ; Danny Gottlieb: drums.